I’m especially excited today as I begin a new series. This time I’m going to be looking at the Armor of God. As with the Lord’s Prayer, I’ll be looking at each section at a time and taking you through what they mean to me. So the first in the series is easily one of my favourites: the Breastplate of Righteousness. 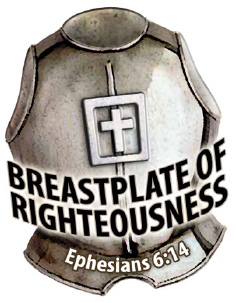 What does it mean to put on the Breastplate of Righteousness? We can go further and ask, what does it mean to put on the Armor of God? As the Bible says we should. My honest opinion is that we don’t have to pray it everyday, but to believe it and live it. Armor is worn by warriors and soldiers, and they wear it in every battle. Only when we put on the armor could we stand against the attacks of the enemy. Alright, so what is the Breastplate of Righteousness, and what is its purpose? As with all the parts of a soldier’s armor, we have to look at the enemy in order to understand. One of the many lies the devil throws at us is that we aren’t righteous, and on our own, we aren’t. Of course the devil wants us to look at our own righteousness, because when we do, our salvation will depend upon our performance, and not on His. The truth is this, we have been made righteous through the blood of Jesus. The Breastplate of Righteousness is not of our own, but of Christ’s. We are the righteousness of Jesus. If we wear our own righteousness, and put our trust in it to protect us, it will always fail. The enemy will always find weak points, and he’ll take every advantage he can find. We have to believe that we have been made righteous by Christ’s work on the cross, and not our own. That’s what is means to wear the Breastplate of Righteousness. When we wear the righteousness of Christ, there can be no error in the fight.